Emanuel Andrade and Bon Jovi. Photo Credit ©AnneGittinsPhotography. Wellington, FL – January 3, 2018 – It was another successful week of competition for Emanuel Andrade of Wellington, FL during ESP New Year’s competition at Palm Beach International Equestrian Center (PBIEC), as the young talent scored another major win, this time in the $30,000 UHealth Grand Prix. Andrade piloted his own Bon Jovi and raced to complete the fast track in 43.353 seconds to best the class. 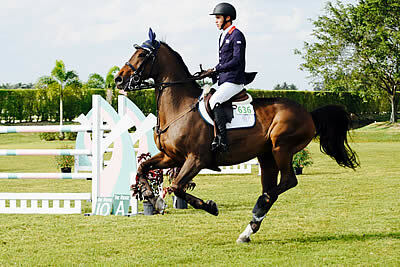 The course, designed by Hector Loyola of Wellington, FL, welcomed back six of the original twenty-four entries to the jump-off. Alejandro Karolyi of Wellington, FL rode Lincourt Gino, owned by Monica Carrera, to second place after a jump-off time of 45.546 seconds. Third place went to Alexis Trosch of Wellington, FL and his own Cantara Z, after crossing through timers in 45.978 seconds. The $10,000 UHealth Open Stake Class saw Alex Granato of Wellington, FL and Beorn, owned by Moyer Farm, LLC, finish atop the class after crossing through the jump-off timers in 35.775 seconds. Emanuel Andrade and Garinco Van De Lijsaerd, owned by Andrade, collected second place with a time of 37.199 seconds. Lauren Tisbo of Wellington, FL and Tequestrian Farms, LLC’s Jeleena De Muze finished in third place after securing a finish in 38.282 seconds. The $1,500 Low Children’s Jumper Classic saw Ellen Mollerus of Larchmont, NY and Joan Mollerus’ Corona 120 take first place with a jump-off time of 39.772 seconds, while Charlotte Matthews of Bayville, NY and Sagamore Farm’s Castellina Della Caccia finished in second place with a time of 44.477 seconds. Eva Harris of Wellington, FL and Harkopp Farm’s Showtime De Pleville rounded out the top three with a time of 44.497 seconds. The $1,500 Marshall & Sterling Child/Adult Jumper Classic presented by Accuhorsemat saw Taylor Kraft of Frenchtown, NJ and Tracey Howe’s Cosmopolite S ride to top honors in the class after finishing their jump-off track in 40.109 seconds. Chloe Wilkenfeld of Bedford, NY and Vrai Diams Palatie, owned by Limelight Farm, took second place after stopping the clock in 40.628 seconds. Sarah Tredennick of Wellington, FL and her own Annwood Lane secured third place with a time of 40.628 seconds. Laura E Southard of Mount Dora, FL rode to victory aboard her own Duft 27 in the $1,500 Low Adult Jumper Classic after stopping the jump-off timers in 41.932 seconds. Chole Friedheim of Pennington, NJ and Choper Enterprises, LLC’s Jazir took second place with a time of 44.594 seconds. Jennifer Evancic of Versailles, KY and her own Loguestown earned third place after a jump-off time of 45.096 seconds with eight faults. The $5,000 Martha Jolicoeur Douglas Elliman 1.35m Stake saw James Chawke of Ireland and Renee Walker’s Benjamin take first place with a jump-off time of 39.781 seconds, while Carlos Quinones of Wellington, FL and Michelle Navarro-Grau’s Tazman collected second place with a time of 40.836 seconds. Coco Fath of Fairfield, CT collected third place with Hillside Farm LLC’s Cohbanta, after finishing with a time of 41.541 seconds around the short course. The $2,500 NAL Low Junior Jumper Classic was won by Emma Seving of Newton Square, PA and her own Easy Money, after crossing through jump-off timers in 42.495 seconds. Dylan Laiken of Wellington, FL and Show Show, owned by Alex Jayne, collected second place with a time of 40.528 seconds with a an additional four faults. Zachary Yariv of Wellington, FL and his own In Style finished in third place after finishing in 45.038 seconds and a rail. The $2,500 Low Amateur Owner Jumper Classic saw Brianne Link of East Islip, NY and her own Bilbao finish atop the class as the fastest combination contesting the jump-off with a time of 40.028 seconds. Sabrina Lefebvre of Terrebonne, QC and her own Alaska earned second place after completing the short course in 41.083 seconds. Emma Cullen of West Berwyn, PA and 3 Seas, LLC’s Grandy De Laubry finished in third place after stopping the timers in 41.824 seconds. 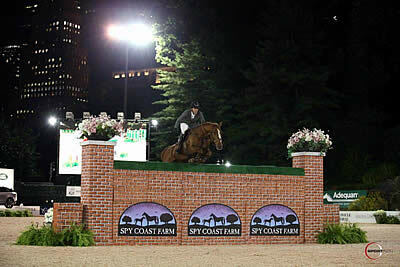 Hannah Isop of Pawlings, NY and Tracy Freels’ Red Ryder finished atop the $5,000 USHJA National Hunter Derby. Jennifer Bliss of Loxahatchee, FL and Harris Hill Farm LLC’s Sugarman captured second place. Third place honors were presented to Kim Barone of Watertown, MN aboard Cynthia Bulwicz’s Cyril. Meghan Knapic of Blue Point, NY was awarded champion of the ESP Hunter 3’3″ Division aboard her winning mount Most Likely. Reserve champion was presented to David Oliynyk of Franklin, MA and Generous, owned by Lori Gaudet. Sandra Ferrell of Bernville, PA and Dapper, owned by Stephanie Bulger, were champions of the Triple Crown Nutrition Green Hunter 3’3″ Division, while reserve champion was awarded to Chris Ewanouski, riding Atta Boy, owned by Geoffrey Sutton. The #1 Education Place Junior Hunter 15 and Under Division saw Sam Walker of Nobleton, ON riding Bocelli, owned by Karen Macdonald, take top divisional honors. Reserve champion was awarded to Isha Swani of Ponte Verda Beach, FL and Park Place, owned by Shadowfax Equestrian LLC. The Gold Coast Feed Performance Hunter 3’3″ Division saw Alyssa Bokor of Williamsville, NY and Candid, owned by Jordan Allen, rise to the top of the division with several consistent performances. Jennifer Bauersachs of Frenchtown, NJ and New Addition, owned by Spring Hill Farm, captured reserve champion honors for their efforts in the division. Olivia Sweetnam of Wellington, FL and Mr. Magoo, owned by Sweet Oak Farm, finished atop the Score at the Top Small Pony Hunter Division; Clara Propp of New York, NY collected reserve champion with Benlea Mizzou, owned by Aquitaine Equine. Emanuel Andrade and U. Photo Credit ©AnneGittinsPhotography. Wellington, FL – December 19, 2017 – Emanuel Andrade of Wellington, FL and his own U took top honors in the $25,000 Ultima Fitness Grand Prix at ESP Holiday I hosted at Palm Beach International Equestrian Center (PBIEC) on Thursday, December 14, after stopping the jump-off timers in 41.904 seconds. Liza Finsness of Wellington, FL and Shiver captured second place with a jump-off time of 43.292 seconds, ahead of Michael Morrissey of Wellington, FL and QBS Equestrian LLC’s La Lopez 3, who narrowly missed first place and finished the course, designed by Mauricio Garcia, with a time of 38.617 seconds but with four added faults. Later in the week, Todd Minikus of Lake Worth, FL and Carlo, owned by North Face Farm, captured a speedy win in the $25,000 ProElite Grand Prix at ESP Holiday II, besting a class of 44 entries on Sunday, December 17. The pair finished a strong first round on the course, also designed by Garcia, and proceeded to stop the jump-off timers in 37.549 seconds, just tenths of a second faster than Alvaro Tejada of Guatemala and Voltaral Palo Blanco, owned by Agroprosa, who completed the round in 38.187 seconds. Liza Finsness of Wellington, FL once again rode Shiver to another top three finish, this time finishing the short course in 39.33 seconds. Ian Millar of Perth, ON and Vittorio 8, owned by Future Adventures, championed the ESP Holiday I $10,000 Ultima Fitness Open Stake after completing their jump-off round in 34.838 seconds to best the class. Emanuel Andrade of Wellington, FL and Jenni’s Choice, owned by Andrade, collected second place with a time of 35.787 seconds, as well as third place aboard his own Gran Mamut, rounding out the top three with a time of 35.138 seconds and eight faults. The ESP Holiday II $10,000 ProElite Welcome Stake was won by Alex Granato of Wellington, FL and Beorn, owned by Moyer Farm, LLC, after crossing through jump-off timers in 32.49 seconds. David Oberkircher of Collegeville, PA and Upper, owned by Southfields Farm LLC, earned second place with a time of 34.037 seconds. Alejandro Karolyi of Wellington, FL and Willow, owned by Amalaya Investments, finished in third place after finishing in 34.042 seconds. The ESP Holiday I Child/Adult 1.10m Jumper Classic saw Julia Strawbridge of West Grove, PA and his own Ailee rise to the top of the class. The pair completed their round in 77.308 seconds with two time faults for the win ahead of Strawbridge and her second mount C’est La Vie, also owned by Strawbridge, who completed the track in 78.878 seconds and with three faults. Christina Castillo finished with a third-place ribbon aboard Eduardo and Isabel Castillo’s Waltaire Palo Blanco, who stopped the timers in 69.142 seconds and with four faults. Sophia Thomson of Jupiter, FL and her own Bull Run’s Eternal rode to victory in the $1,500 Low Child/Adult Jumper Classic during ESP Holiday I, stopping the jump-off timers in 40.549 seconds. Joshua Baird of St. Charles, IL and Lollipop S secured second place with a time of 41.661 seconds, while Juliett Johansson of Fort Lauderdale, FL and her own Viva’s Roxanna W took third place after adding four faults to their jump-off time of 41.292 seconds. Elizabeth Kirby of Wellington, FL and Cor de Pomme, owned by E. K. Equestrian LLC, finished in first place in the ESP Holiday I $2,500 M&S Child/Adult Classic after finishing their second round in a time of 43.542 seconds, during ESP Holiday I. Bevo Tarika of Fairfield, CT and Kanneau, owned by Tarika, took second place as the only other combination to advance to the jump-off round. The pair finished in 41.658 seconds with four faults. Lisbeth Hazoury of Wellington, FL and Los Establos Sporthorses Corp.’s Valmach des Abbayes finished in third with 4 faults in the first round. Lauren McCaulley of Lake Charles, IL and Umano de la Ruche, owned by Ilan Ferder, rode to victory in the ESP Holiday II $1,500 NAL Child/Adult Jumper Classic with a jump-off time of 42.241 seconds. Alexandra Elkins of Dallas, TX and Shosy TSP, owned by Elkins, finished in second after stopping the jump-off timers in 43.747 seconds. Bruna Silva of Windermere, FL and Lorenza Jmen secured third place with a time of 47.401 seconds. Anne Meyer of Plymoth, MN and Stella Luna, owned by Meyer, took home the blue ribbon in the ESP Holiday II $2,500 M&S Child/Adult Classic with a speedy jump-off time of 41.725 seconds. Phoebe Alwine of Delray Beach, FL and Zenith Dance, owned by In the Clover Equestrian, finished the class with a jump-off time of 42.328 seconds for second, while Kaila Robert of St. Bruno, QB captured third aboard Ninja, owned by Ecuries La Montee, after riding the fast track in 42.889 seconds. The ESP Holiday II $1,500 Low Adult Jumper Classic was championed by Catherine Kenny of Wellesley, MA and Nubia 11, owned by Maggie Savoie, as the pair finished with a jump-off time of 36.248 seconds, ahead of Nicole Sarett of Vero Beach, FL and Vaya Con Dios, owned by Alexandra Vanderrest, who finished their jump-off round in 42.92 seconds. Jenny Swanson of Dover, MA and Patriot K, owned by Swanson, secured third place with a second-round time of 35.682 seconds and four faults. Margaret O’Meara of Kirkland, WA and Woodland Way, Inc.’s Just Nick, championed the ESP Holiday I Child/Adult Amateur Hunter Division, while Sidney Jefferson of Toronto, ON and her own Socialite took home reserve champion honors. The Green Hunter 3′ Division of ESP Holiday I saw Victoria Colvin of Loxahatchee, FL and Fortitude, owned by Debi Maloney and Sarah Cressy, capture the divisional championship. Hannah Isop of Pawling, NY and Calica, owned by Christine Watkins, rode to reserve. The ESP Holiday I USHJA Hunter 2′, 2’3 & 2’6″ Division was won by Kelly Mullen of Franklin, TN and Three Wishes, owned by Warioto Farms Inc. Wendy Picard of Boca Raton, FL and her own Extraordinary captured reserve champion honors. Penny Lombardo of Loxahatchee, FL and Northampton, owned by Catherine Bray, finished atop the division in the ESP Holiday I USHJA Hunter 2’9″ Division. Lombardo also collected reserve champion with First Star, owned by Bray. The Score at the Top Small Pony Hunter Division saw Cecilia Perry of North Venice, FL guide Sparkle, owned by Fielding Stichman, ride to the divisional title in ESP Holiday I, ahead of Sterling Malnik of Ocean Ridge, FL and Amber Asbell-Jackson’s May-B-Tango, who were awarded with reserve champion. Adam Edgar of Leesburg, VA and Honor, owned by Salter Hydinger, took champion honors in the ESP Holiday II Adult Amateur Hunter Division. Catherine Kenny of Wellesley, MA and her own Bliss received reserve champion honors. The ESP Holiday II Cross Rail Hunter Division was captured by Orly Antvey of Plantation, FL piloting Heaven Scent Raindrop, owned by Melanie Antevy. Reserve champion went to Matthew Scharbo of Winnetka, IL and Lanes End’s Shimmer. Libbie Gordon of Statesville, NC and Unexpected, owned by Derby Lane, LLC, were champions of the ESP Holiday II Junior Hunter 3’3″ Division. Reserve champion was also awarded to Gordon, riding her own More Fun. Alexa Elle Lignelli of New York, NY was awarded champion of the Score at the Top Small/Medium Green Pony Hunter Division during ESP Holiday II. Her winning ride was Just Right, owned by Agatha Lignelli. Reserve champion was also presented to Lignelli and Entourage, owned by the Lignelli Family. Emanuel Andrade and Bon Jovi. Photo Creditit ©Sportfot. Mill Spring, NC – July 16, 2017 – Emanuel Andrade (VEN) and Bon Jovi found success on the Grass Complex at Tryon International Equestrian Center (TIEC), overcoming a challenging short course in 38.465 seconds for the win. The pair finished ahead of Aaron Vale (USA) and Stakko, who took second place with 40.145 seconds, and Amanda Derbyshire (GBR) with Sibell BH in third with a four-fault jump-off time of 37.404 seconds. The track, set by Martin Otto (GER), tested 34 entries on the Grass Complex at TIEC, and Andrade commented that while he likes riding on grass and footing equally, riding on the grass is a nice change. “The grass always rides differently. It didn’t look huge, but it was hard, because a lot of people were having rails [down] and there were only five clear. It wasn’t easy at all,” he said. Bon Jovi, a 2006 Dutch Warmblood gelding (Verdi x Corland) owned by Andrade, is a talented mount who was able to go clear around the short course and shave more than a second from his nearest competitor’s time. “My horse is naturally quick and I think it was our day. I showed him last night and this morning I tried to change a couple things and it went great actually. I’m very happy with the results. Everything went correctly and we won,” explained Andrade. Andrade and his horses will stay at TIEC for a while longer to contest a few more shows before heading to New York to close out his year at HITS Saugerties. With the win coming at the end of the competition, Andrade noted that the $35,000 1.45m Tryon Challenge CSI 2* was a great way to end the week. West Palm Beach, FL (February 18, 2017) – The sixth week of The Ridge Palm Beach Series welcomed back the popular monthly hunter showcase, Hunter Derby Days, as well as the circuit’s standard $15,000 1.40m Grand Prix and full hunter and jumper divisions at the Jim Brandon Equestrian Center. With the winter equestrian season now in full swing, the Palm Beach Series full hunter and jumper divisions run each week from Wednesday to Sunday, with unique show offerings each week including USEF Equitation Tuesdays, the unique and spectacular venues of the Turf Tour, the elegance and performance of Hunter Derby Days, and, newly launched in 2017, Schooling Dressage Shows. Week 6, which ran from February 8-12, featured the February 10th Hunter Derby Day and Saturday’s $15,000 1.40m Grand Prix, presented by RV Sales of Broward. The second of The Ridge Palm Beach Series’ Hunter Derby Days commenced February 10th, featuring a $5,000 USHJA National Hunter Derby, $15,000 USHJA International Hunter Derby, and a $5,000 USHJA Pony Derby. Held under the spectacular covered arena at Jim Brandon, the three classes featured a challenging and beautifully designed course, as well as some of the top horse and rider combinations showcasing the athleticism of the performance hunter. Friday’s events kicked off with the USHJA National Derby, continued to the International Derby in the afternoon and concluded with the Pony Derby under the lights in the evening. Bossa Nova, piloted by Julie Oliver, danced over the beautiful hunter course set for the $5,000 USHJA National Hunter Derby, besting a class of 26 horses to finish on a score of 186. Kim Barone rode Easy Street HU to reserve honors, and her other mount, Dolce Vita, to third place. Dolce Vita, with Barone in the saddle, was the USHJA National Hunter Derby Champion at January’s Hunter Derby Day. With the jumps and prize money raised, the $15,000 USHJA International Hunter Derby began with Kelly Farmer and Scripted took an early lead with 182, but eventually was bested by her own effort with Because to secure victory. Scripted’s early effort was bumped to fifth by Amy Momrow and Aeroplane, Jennifer Hannan and Flamingo-K, and taking reserve honors, last month’s USHJA International Hunter Derby champions, Louise Serio and Rock Harbor. From the big leagues to the ponies, the covered arena transformed once again into a miniaturized version of the International Derby course and welcomed a group of talented ponies and riders. An exceptional round by Kat Fuqua and Somekindawonderful led the field for the evening’s $5,000 USHJA Pony Derby from beginning to end. Fuqua and her Captain America, who were the champions of January’s USHJA Pony derby, finished third, with Augusta Iwasaki and Small Suggestion taking reserve honors. Consistently attracting top names in the sport, including Olympians, medal finalists, and international champions, the Hunter Derby Day competitions offer an exclusive way to gain national and international experience, as well as qualifying scores, in a utopian show atmosphere. For the second week in a row, Venezuela’s Emanuel Andrade and Belita ruled the Grand Prix, putting in impressive double clear rounds that proved to be uncatchable. The first double clear round went to Ilan Bluman and Eax Run Run LS, who finished on a final jump off time of 34.385. Soon after, Lauren Crooks and Columbeille de Reve stole the lead from Bluman, only to have it stolen almost immediately by Andrade and Benita. The athletic bay mare and the Venezuelan young rider put in a blazingly fast jump off round, taking a commanding lead over the rest of the field with a 29.431. A late effort by Kelly Cruciotti and My Flores bumped Crooks into third, but no horse & rider combinations were able to challenge Andrade’s lead, despite a field full of accomplished international Grand Prix competitors including Daniel Bluman, Darragh Kenny, Pablo Barrios, and Peter Jordan. The Ridge at Wellington’s Palm Beach series continues with full hunter and jumper divisions each week, Wednesday – Sunday, as well as February 24th’s Turf Tour at Polo West, USEF Equitation Tuesdays, and each week a $15,000 1.40m Grand Prix on Friday and a $5,000 1.30m Open Stake on Saturday. Visit www.TheRidgeFarm.com for full prizelists and schedules! West Palm Beach, FL (February 13, 2017) – In a banner week for South America and the Caribbean, the Palm Beach Series’ unique hunter and jumper offerings during Week 5, which ran February 1-5, were headlined by the circuit’s trademark Turf Tour and accompanying $15,000 1.40 Grand Prix. Envisioned as a utopian compliment to Wellington’s booming winter equestrian season, the Palm Beach Series diverse show offerings draw a cross section of competitors from aspiring leadliners to international Grand Prix and Olympic champions. From its main base at Jim Brandon Equestrian Center, just minutes down Forest Hill Boulevard from the city’s equestrian mecca, full divisions of hunters and jumpers run weekly in tandem with USEF Equitation Tuesdays, Palm Beach Series Schooling Dressage, Hunter Derby Days, and the Turf Tour. Displaying the brave riding style that seems to come standard in South America’s show jumpers, Pan Am, World Equestrian Games, and Rio 2016 Olympic rider Emanuel Andrade rode Benita and Jenni’s Chance to first and second placings in Friday’s $15,000 RV Sales of Broward 1.40 Grand Prix. Held Friday in the pristine all weather arena at Jim Brandon Equestrian Center, Andrade and Jenni’s Chance had an early double clear finishing on 38.174 in the jump-off. But almost as soon as Andrade’s placing was announced, he was back in the arena to best his own time with Benita. In a thrilling jump-off effort, Benita, under Andrade’s guidance, soared over the final vertical and through the timers to best Jenni’s Chance with a jump off time of 35.263. Despite a number of valiant efforts from the rest of the field, no one could catch Benita or Jenni’s times. Colombia’s Ilan Bluman rounded out the top three rankings with Eax Run Run LS. The talented combination of Manuel Fernandez Hache and Al Calypso proved exceptional during Saturday’s Turf Tour 1.45m Grand Prix, putting the Caribbean nation at the top of the standings. Veterans of the 2015 Pan American Games, Hache and Al Calypso navigated Saturday’s Turf Tour course with the grace and poise of seasoned international competitors. One of the last combinations to stretch their legs on the grass field at The Ridge at Wellington’s home farm, their double clear effort and 41.533 jump-off time stole the lead from the US Olympian Laura Kraut and Cavalia. The second of the twice-monthly Palm Beach Series Schooling Dressage Shows commenced Tuesday, February 7th, with riders of all levels enjoying the serene environment, exceptional footing, and world-class judges. From young horses and riders at their debut dressage show, to seasoned Grand Prix and international competitors fine-tuning their Freestyles, last Tuesday’s judge, GP & BA certified German dressage expert Heiner Jeibmann, saw everything from Training and Third Level to the Prix St. Georges and Grand Prix. The weekly schooling shows run every other Tuesday, with the next event being held February 21st and featuring FEI Judge Janet Foy. PBS Schooling Dressage is held at the Jim Brandon Equestrian Center, a full service show grounds just minutes from Wellington’s center that includes multiple all-weather lighted arenas, an oversized covered arena, two large barns of permanent stabling, a lunging area, and ample parking for trucks, trailers and cars. Designed to put horses and riders in a new, unique atmosphere, the dressage classes begin at 4pm. For more information and full prizelist, visit www.TheRidgeFarm.com. Emanuel Andrade and Nokia De Brekka. Photos ©ManciniPhotos. 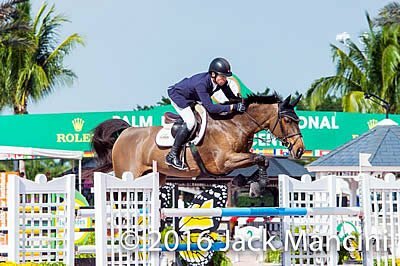 Wellington, FL – January 4, 2017 – Emanuel Andrade of Wellington, FL and Nokia De Brekka finished atop the $30,000 UHealth Grand Prix at Palm Beach International Equestrian Center (PBIEC), besting a class of 39 entries. Andrade and Nokia De Brekka finished the jump-off track in 42.673 seconds to take the win, while Jackson Brittan of Westlake, TX and Easy Contact Humlan rode to second place with a time of 45.562 seconds. Leslie Howard of Darien, CT piloted Up and Blue Chapelle to third after crossing through the timers in 45.816 seconds. Andrade and his own Nokia De Brekka have had a phenomenal season at PBIEC during the 2016 Holiday Series, amassing several top finishes in numerous Welcome Stake classes, as well as in the grand prix competition offered weekly. Andrade bested a talented jump-off, which saw six riders advance from the first round. Only the top three finishers completed the day with a double clear effort around the track set by Hector Loyola of Wellington, FL. Andrade rode three other mounts in the class including Dipssy, Cortina 186, and Bon Jovi, all proving to be highly competitive in grand prix competition. Continuing his preparation for the Winter Equestrian Festival (WEF), Andrade has exemplified his skill and knack for speed during pre-season competition, which will be useful looking towards nearing circuit. The ESP Holiday Series will conclude on Sunday, January 8, ahead of the Winter Equestrian Festival (WEF) circuit, which will begin on Wednesday, January 11, and continue through Sunday, April 2, 2017. Conor Swail of County Down, Ireland guided Flower, owned by FINCA Horses Inc., to top honors in the $10,000 UHealth Open Stake with a speedy jump-off time of 39.876 seconds. Shane Sweetnam of Wellington, FL and Cobolt, owned by The Blue Buckle Group, finished in second place after crossing through the timers in 40.121 seconds. Nicole Shahinian-Simpson of Wellington, FL and Akuna Mattata, owned by Silver Raven Farms, rounded out the top three with a jump-off time of 41.489 seconds. The class saw 32 entries contest the first major class of the week’s competition during the ESP New Year’s Show. Nine combinations moved forward to test the short course designed by Hector Loyola of Wellington, FL. Six pairs finished the class with a double clear effort in hand. Luis Larrazabal of Wellington, FL and Champion for Volt, owned by Augusto Surico, rose to the top of the $5,000 1.35m Jumper Classic presented by The Brazilian Court Hotel after besting second place by nearly six seconds. Larrazabal stopped the timers in 42.957 seconds ahead of Carlos Quinones of Wellington, FL and Sato Yama, owned by Michelle Navarro-Grau, who claimed second place with a time of 48.703 seconds. Rodrigo Pessoa of Wellington, FL and Chaco 34, owned by Francesca Damasceno, took third place after finishing the track in 49.224 seconds. The $1,500 Low Children’s Jumper Classic presented by Equine Couture & Tuff Rider saw Ellen Mollerus of Larchmont, NY and Caretino, owned by Katherine Strauss LLC, take top honors after completing the short course in 34.237 seconds. Eva Harris of Wellington, FL and Showtime De Pleville, owned by RussellSportHorses LLC, took second place with a time of 37.51 seconds ahead of Dakota Champey of Far Hills, NJ and Unsomnie De La Roque, owned by Hampton Farms LLC, who took third place with a time of 39.248 seconds. The $1,500 Low Adult Jumper Classic presented by Equine Couture & Tuff Rider saw Carson King of Bedminster, NJ and Middlemarch, owned by River Run Farm LLC, claim victory in the division as they completed the jump-off track in 36.98 seconds. Devon Degen of Watermill, NY and Coachella, owned by Degenmoor Farm Inc., rode to second place with a time of 38.053 seconds. Deborah Imperatore of Basking Ridge, NJ and Ben-Sky, owned by J&J Imperatore LLC, finished in third, after dropping a rail for four faults and crossing through the timers in 37.736 seconds. Samantha Johnson of Skillman, NJ and her own Gallant rose to the top of the leaderboard in the $1,500 Children’s Jumper Classic with a time of 34.439 seconds. Sabrina Lefebvre of St. Marc Sur Richeliue, QC and Wedding Day finished in second place with a jump-off time of 35.69 seconds, while Ally Marrinan of Saunderstown, RI and Ruby, owned by Rose Hill Farm, rounded out the top three with a time of 36.157 seconds. Stephanie King of St. Augustine, FL and her own Co-Starr captured victory in the $1,500 Adult Amateur Jumper Classic presented by Accuhorsemat after completing the track with an efficient time of 34.04 seconds. Laura Anderson of Ashland, VA and her own HHS Cheiro took second place as the only other combination to advance to the jump-off round. The duo added four faults to their time of 40.959 seconds. Devon Degen of Watermill, NY and Zippo, owned by Degenmoor Farm Inc., rounded out the top three after adding a single time fault in the first round to finish in 77.255 seconds. The $2,500 High Amateur Owner Jumper Classic presented by Equiline saw McKayla Langmeier of East Granby, CT and Tahiti Island, owned by Blue Hill Farm, LLC, take top honors with a time of 43.26 seconds. Daisy Farish of Versailles, KY and Balance, owned by Chansonette Farm LLC, captured second place, completing the course just behind Langmeier with a time of 43.549 seconds. Michelle Navarro-Grau of Wellington, FL guided her own Yidam to an exciting finish in the class, collecting a time of 43.654 seconds for third. The $2,500 NAL Low Amateur Owner Jumper Classic saw Lynsey Whitacre of St. Joseph, MO and her own Zorzuela Leuze Z ride to victory after finishing with a time of 41.179 seconds. Rileigh Tibbott of Ebensburg, PA and her own Cento per Cento CG captured second place with a time of 43.01 seconds ahead of Meghan Hurst of Baton Rouge, LA and her own Fidel Cavaro who earned third place with a time of 43.369 seconds. Catalina Peralta of Geneva, FL and Chopin Z, owned by Grindstone Farm LLC, finished atop the $2,500 Low Junior Jumper Classic after completing the jump-off round in 41.016 seconds. Faith Davis of Gurley, AL and her own Da Vinci took second place, finishing just behind Peralta with a time of 41.303 seconds around the short course. Isabella Andreu of Wellington, FL and Grannit Du Petit Bois, owned by Ilsa Franzuis & Jorge Andreu, finished in third place with a time of 42.234 seconds. Chloe Wilkenfeld of Bedford, NY and Urben, owned by Ashley McIlwain, rose to the top of the leaderboard in the $1,500 NAL Child/Adult Jumper Classic after completing the jump-off track in 38.471 seconds. Morgan Champey of Far Hills, NJ and Baronesse, owned by MDHT Equestrian, LLC, finished in second with a time of 39.739 seconds, while Samantha Karp of Wellington, FL and her own David rode to third place, stopping the timers in 40.955 seconds. Kim Barone of Watertown, MN and Easy Street HU, owned by Raven Ridge Farm, rode to the top of the class in the $5,000 USHJA National Hunter Derby after receiving a two round score of 173. Emma Weiss of New York, NY and her own Cheveaux took second, finishing just behind Barone with a score of 172.5. Ashton Alexander of Ocala, FL and Amazone De La Cense, owned by Plain Bay Farm, secured third, earning a 165. The derby featured 21 entries, while Barone championed the class with an 86 in the first round and an 87 in the handy. Weiss earned the high score of the day aboard Cheveaux after receiving an 89 for their first round effort. Victoria Colvin of Loxahatchee, FL and For Ever, owned by Victoria Colvin, LLC, captured first place in the USHJA Green Hunter Incentive Program (PGIP) with a score of 81. Colin Syquia of Wellington, FL and Samba’s Secret, owned by Jennifer Smith, captured second place with a score of 78, while Maria Rasmussen of Oak Creek, WI and O. Edward, owned by Sydney Hamel, also finished with a score of 78 for third. The $1,000 3’6″ Junior/Amateur Owner Hunter Classic presented by Sweet Oak Farm saw Emma Weiss of New York, NY and Cheveaux take top honors with a two round score of 168, while Michael Williamson of Loomis, CA and Boris, owned by Vlock Show Stables LLC, took second place, finishing just a point behind Weiss to receive a 167. Krista Weisman of Brooklyn, NY and Reality, owned by Krista & Alexa Weisman, captured third place with a score of 162. Ashley Vogel of Mequon, WI and her own Avignion rode to victory in the $1,000 3’3″ Junior Hunter Classic presented by Sweet Oak Farm after receiving a total score of 170 from the judging panel. Jaden Olson of Parker, CO and her own Conradical took second place after receiving a 161, while Samantha Braswell of Wellington, FL and Pinehurst, owned by Two Goals Farm LLC, rode to third place with a score of 150. Martha Ingram of Nashville, TN and Ice Time, owned by John & Stephanie Ingram, LLC, rode to victory in the $1,000 3’3″ Amateur Owner Hunter Classic presented by Sweet Oak Farm after earning a two round total score of 167. Lindsay Maxwell of Beverly Hills, CA piloted her own Kingston to second with a score of 166.5, while Krista Weisman of Brooklyn, NY and Concept, owned by Krista & Alexa Weisman, took third with a 166. The $500 Large Pony Hunter Classic presented by Moorcroft Inc. saw Ansley Wright of Manalapan, FL and Serenade in Blue, owned by Deborah Brown-Moon, take top honors with a score of 158. Caroline Ellis of Weston, MA piloted All about Blue, owned by Artillery Lane, LLC, to second place with a score of 156 ahead of Dakota Champey of Far Hills, NJ and Tantallon Co-Captain, owned by MDHT Equestrian, LLC, who earned a 148 for third place. Samantha Takacs of Oldwick, NJ and IFlirt, owned by MDHT Equestrian, LLC, rode to victory in the $500 Small Pony Hunter Classic presented by Moorcroft Inc. after receiving a two round score of 162. Caia Watridge of St. Augustine, FL and her own Heavens to Betsy secured second place with a 160, while Allison Coleman of Wellington, FL and her own Training Wheels rounded out the top three with a score of 154. The $500 Medium Pony Hunter Classic presented by Moorcroft Inc. was won by Sienna Pilla of Ridgefield, CT aboard Robin Hill’s Snapshot, owned by Piccolino Farm LLC, who topped the class with a score of 161. Alexandra Lynn Willner of Boca Raton, FL and Oakledge Fire and Rain, owned by Donald Stewart, finished with a 160 for second place. Campbell Hudkins of Farmington, CT and Swingtown, owned by Peacock Ridge, LLC, rounded out the top three finishers with a score of 154. For more information on PBIEC and to view a full list of results, please visit www.pbiec.com. Andrade and Nokia De Brekka. Photo Credit ©ManciniPhotos. Wellington, FL – December 17, 2016 – Emanuel Andrade of Wellington, FL concluded a tremendous week at Palm Beach International Equestrian Center (PBIEC) after taking top honors in both the $25,000 TACKNRIDER Grand Prix and $10,000 TACKNRIDER Stake during ESP Holiday I competition. Andrade finished one, two, three in the $25,000 TACKNRIDER Grand Prix aboard Nokia De Brekka, Dipssy, and Bon Jovi, respectively. Guiding Nokia de Brekka to the win with a time of 44.716 seconds, Andrade also produced two clear rounds with Dipssy, finishing in 45.357 seconds and Bon Jovi completing the track in 45.794 seconds. Andrade had four entries in the class and amassed an impressive finish with his top mounts following in consecutive order. The class featured 32 combinations and a large jump-off of 12 entries, while course designer Hector Loyola of Wellington, FL built the track. Andrade outmaneuvered the class, finding the quickest routes around the short course with each of his mounts who qualified for the jump-off. Andrade’s three mounts were the only to finish with a double clear effort on the day. Andrade has excelled at PBIEC since his return to Wellington late fall and feels that his horses are in top shape and gaining strength in the ring that is essential to being competitive at the top levels. “All three of my rides were the only double clear rounds today and it was a tough track. I’m very proud of my horses,” he added. Andrade entered the ring on Bon Jovi knowing that he had already secured first and second place, which is an interesting but unusual position for riders contesting a competitive grand prix. Demonstrating his intense will to win, Andrade wanted to try and best his own winning time. “When I went in on Bon Jovi I wanted to try and beat myself. That’s the best part of competing is having the chance to try and beat yourself in a class like this,” he continued. The Venezuelan star has always been a tough and consistent competitor during the Winter Equestrian Festival (WEF), garnering top accolades in numerous divisions throughout the 12-week circuit. This year, the Under 25 classes is set to be the focus for Andrade, while an exciting new mount will take center stage on Saturday nights under the lights. Andrade also took first place aboard Dipssy in the $10,000 TACKNRIDER Stake earlier in the week, as the pair navigated the jump-off track in 37.167 seconds ahead of Ian Millar of Perth, ON, who guided Vittorio 8 to second place with a time of 38.82 seconds. Wilhelm Genn of Lebanon, OH and Bugatti rounded out the top three after completing the track in 39.029 seconds. The class saw six combinations qualify for the short course, while a total of 26 entries took to the initial track. The $2,500 M&S Child/Adult Jumper Classic was championed by Samantha Karp of Wellington, FL and her own David, who paced the class with a 35.07 in the jump-off round for the win. Stephanie Ann Cook of Franklin, TN and Fidele, owned by Lionsway Farm, captured second place after adding four faults to their time of 38.375 seconds. Deborah Perkins of Wellington, FL and Emerald Grace, owned by Jimmy & Danielle Torano, finished in third after dropping a rail for four faults and completing the track in 40.029 seconds. Filip de Wandel and Innocent Nina, owned by Five Way Farm LLC, captured top honors in the $5,000 1.35m Jumper Classic after besting the jump-off round with a time of 46.55 seconds. Denis Coakley of Lake Worth, FL and Sterling Un Prince, owned by Matt Garrigan, finished in second place after completing the track in 46.748 seconds, while Conor O’Regan of Upperville, VA and Touche Windsor Z, owned by Windsor Farm Sales, rounded out the top three finishers after adding four faults to their time of 47.053 seconds. The $1,500 Low Child/Adult Jumper Classic presented by Equine Couture & Tuff Rider saw Star Schatten of Franklin, TN and Cayotee, owned by Lionsway Farm rise to the top of the competitive class. The pair finished the short course in 34.86 seconds ahead of Samantha Briggs of Lexington, KY and Leonardo, owned by Higgns’ Investments, who stopped the timers in 37.519 seconds. Zayna Rizvi of Greenwich, CT and Forget Me Knot, owned by Peacock Ridge, LLC, secured third place after completing the track in 39.702 seconds. Madeline Thatcher of Bluffdale, UT had a spectacular weekend in the Amateur Owner Hunter 3’6″ 18-35 Division, piloting Sterling, owned by Pony Lane Farm, and Summer Place, also owned by Pony Lane Farm, to champion and reserve champion, respectively. Patricia Griffith of New York, NY guided Chicago, owned by Callie Seaman, to divisional honors in the Green Hunter 3’6″ Division, while Kelley Farmer of Keswick, VA and High Priority, owned by Zenfield Farm, captured reserve champion. Griffith also continued with her win streak aboard Clearline Z, owned by McLain Ward, in the High Performance & Green Hunter 3’9″ Division ahead of Maggie Jayne of Elgin, IL and Like I Said, owned by Pony Lane Farm, who took home reserve champion. The Junior/Amateur Owner Hunter 3’3″ Division saw Elizabeth Kirby of Wellington, FL and Reservation, owned by E. K. Equestrian LLC, ride to the top of the division and earn champion accolades. Hana Bieling of Wellington, FL and Waterfall, owned by Jennifer Combs, were presented with reserve. Christina Rogalny of Wellington, FL and Redeemed, owned by Carol Ruth & Sumner Hill Farms, LLC, led the competition in the Junior Hunter 3’6″ Division presented by #1 Education Place to take home champion honors ahead of Alexa Schwitzer of Muttontown, KY and In Joy, owned by Over the Top Stables LLC, who finished in the reserve position. The Large Pony Hunter Division was championed by Chase Finizio of Boca Raton, FL and California Dreamin’, owned by Millennium Farm, Inc. Sophia Calamari of New Milford, PA and Fox Creek’s Antony Quinn, owned by Dianna Orona, collected reserve champion. Alexandra Lynn Willner of Boca Raton, FL and Anisette, owned by Hannah Hoch, were awarded with the divisional championship after a consistent week of riding. Willner also captured reserve champion honors in the division aboard Rosewood, owned by Hannah Egan. Zayna Rizvi of Greenwich, CT and Canterbrook Prince Charming, owned by Ella Bikoff, found themselves atop the Small Pony Hunter Division, while Mia Green of Delray Beach, FL and Bieber, owned by Laura Barrett-Gurtis, took reserve. The $500 Pony Hunter Classic presented by Moorcroft, Inc. saw Alexandra Lynn Willner of Boca Raton, FL secure first place in the class aboard Anisette, owned by Hannah Hoch. Zayna Rizvi of Greenwich, CT and Anderin’s Momento, owned by Ella Bikoff took second place, while Willner captured third place in the class aboard Rosewood, owned by Hannah Egan. For more information on Palm Beach International Equestrian Center (PBIEC) and to see a full list of results, please visit www.pbiec.com. Emanuel Andrade and Wicked. Photo Credit ©ManinciPhotos. Wellington, FL – November 16, 2016 – Emanuel Andrade of Wellington, FL and Wicked, owned by Hollow Creek Farm, took top honors in the $10,000 Open Stake at Palm Beach International Equestrian Center (PBIEC) during the ESP November competition. Andrade and Wicked completed the jump-off track in 46.848 seconds ahead of David Blake of Wellington, FL and Bella Donna, who crossed the jump-off timers in 47.172 seconds. Richard Neal of Malibu, CA and Ida Gold finished in third, dropping a rail in the jump-off and finishing in 45.151 seconds. The class saw 25 entries test the track set by Hector Loyola of Wellington, FL, as nine combinations advanced to the jump-off round, while only two pairs delivered a double clear effort on the day. Andrade and Wicked, who is a relatively new mount for the talented rider from Venezuela, looked in fine form and have already established a strong partnership. “It was a really good class. I just got back from a long summer of competition and I have a lot of horses that do well in these types of classes and helps to give them experience,” said Andrade. Wicked, a 2007 Warmblood mare, is an exciting new addition in Andrade’s string of top horses and he is confident that the duo can be very competitive at the 1.50m level this winter season. Andrade also commented on the pair’s speedy jump-off time, noting that the mare took the International Ring with confidence. Andrade represented his home nation of Venezuela at the 2016 Olympic Games in Rio de Janeiro, Brazil and is working towards continued success at the top levels of the sport. His return to Wellington was a welcome changed for Andrade and his team, who feel very at home at PBIEC. Robyn Hannigan of Celebration, FL and her own Capacabana rose to the top of the leaderboard in the $2,500 Low Junior/Amateur Owner Jumper Classic as the duo completed the jump-off course in 32.143 seconds. Tanner Korotkin of Wellington, FL and Corphin, owned by Alan Korotkin, finished in second place with a time of 35.664 seconds, while Andre Mershad of New Albany, OH and Zaza, owned by River Farm Sport Horses, rounded out the top three finishers after adding four faults to their time of 32.525 seconds. The $1,500 NAL Child/Adult Jumper Classic was championed by Isabel Sanchez of West Palm Beach, FL and Chino, owned by Anabella Mejia, after the pair dashed through the timers nearly five seconds faster than Mateo Coles of Ft. Lauderdale, FL and Wibrands, owned by Daniela Roy, who earned second with a time of 44.332 seconds. Kara Constantakos of Jupiter, FL and her own Bon Vivant completed the class with five faults in the jump-off round and a time of 45.108 seconds for third. Sabischy Hassler of Wellington, FL and her own Poseidon HM collected the blue rosette in the $1,500 M&S Child/Adult Classic presented by Accuhorsemat as the pair finished a quick and accurate trip in the jump-off round for first place. The pair rode to a time of 39.657 seconds, while Alexis Rappaport of Berwyn, PA and her own Valkenier earned second. Brielle Biggins of Palm Beach Gardens, FL and Good Boy H M took third place honors after adding four faults on course and completing with a time of 35.714 seconds. John Angus of Ft. Lauderdale, FL concluded a banner week in the $1,500 Low Child/Adult Classic presented by Equine Couture & TuffRider, earning first and second place aboard Vertigo, owned by Gordon Munro, and Seacrests Elsa, owned by Stephanie Angus, respectively. Jennifer Kazma of Boca Raton, FL and TH Vechta Cruise finished in third place in the competitive class. Casey Brottman of East Northport, NY and Touche, owned by Cheyenne Sickle & Angus Gordon, were presented with champion honors in the Adult Amateur Hunter Division, while Julie Burton of Loxahatchee, FL and her own Uppercase followed in reserve. Leah Greenstein of Wellington, FL and her own Branson rose to the top of the Children’s Hunter Division presented by UHealth Ear Institute after solid performances throughout the weekend. Isabella Watson of Lake Worth, FL and Worthington, owned by Carol Tucker, rode to reserve champion. The Children’s Pony Hunter Division presented by The Wanderers Club saw Hannah Glanzberg of West Palm Beach, FL and her own Silver Shine awarded with the divisional title for the competition. Sophie Hess of Boca Raton, FL and her own Sunday Morning Jazz finished with the reserve champion rosette. Allyson Blais of Boynton Beach, FL guided her own Captain Darco Heldenlaan Z to top honors in the Junior/Amateur Owner Hunter 3’3″/3’6″ Division presented by #1 Education Place after a strong week of competition ahead of Siena Vasan of Boca Raton, FL and Skolar, owned by Carriage Hill Farm, who collected reserve champion. The Low Adult Hunter Division presented by Pilates Rocks saw Lauren Zaremski of Jupiter, FL and Amorika, owned by Castlewood Farm & Alan Korotkin, split the divisional championship title with Lynn Blanchette of Jupiter, FL and her own All-Star. Eliza Eddy of Lighthouse Point, FL and Ever So, owned by Carriage Hill Farm, took home reserve champion. Schuyler Gobin of Wellington, FL and her own Sharp Charmer were awarded with champion honors in the Open Hunter 3′ Division presented by Neue Schule ahead of Vinissa Blann of Delray Beach, FL and Namesake, owned by Chuck Mayer. For more information on Palm Beach International Equestrian Center (PBIEC), please visit www.pbiec.com. Emanuel Andrade with Walter 61 at the WEF. Photo by © 2016 Jack Mancini. 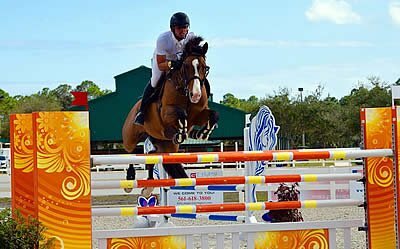 Wellington, Florida – Venezuela’s Emanuel Andrade was named Circuit Champion in the High Amateur-Owner Jumper and the Medium Amateur-Owner Jumper divisions to close out the 12-week Winter Equestrian Festival held from January 13 through April 3 in Wellington, FL. Andrade’s success began during the opening week of competition when he won the $15,000 Maybach – Icons of Luxury High Amateur-Owner Classic riding Walter 61. He went on to score two more High Amateur-Owner Classic victories in week four riding Belita, a nine-year-old Dutch Warmblood mare (Ukato x Voltaire), and again in week eight with Walter 61, a 14-year-old German-bred gelding (Werenfels x Donator). Consistent results all winter with Walter 61 gave the pair the overall High Amateur-Owner Circuit Champion title, presented by Maybach – Icons of Luxury. In the Animo Medium Amateur-Owner division, Andrade claimed the circuit championship title with Rufus de Violaines, his 10-year-old bay selle francais gelding. The pair won the $10,000 Medium Amateur-Owner Classic during weeks two and 11. In addition, Andrade won the $10,000 Medium Amateur-Owner Classic during week eight with Sothis D Ouilly, a nine-year-old grey selle francais mare (Cheers Cassini x Narcos II). With the 2016 winter season drawing to a close, Andrade will begin competing on the Longines Global Champions Tour. The first stop is Miami, FL from April 7 to 10. Andrade is a member of the Vienna Eagles team in the new Global Champions League, competing alongside teammates Danielle Goldstein, Lauren Hough, Rodrigo Pessoa, and Paris Sellon. Andrade represented Venezuela at the 2014 Alltech FEI World Equestrian Games in Normandy, France and was involved in a jump-off for the individual bronze medal at the 2015 Pan American Games in Toronto, Canada. At the age of 19, he hopes to make his Olympic debut in Rio de Janeiro, Brazil this summer. Andrade is based at Hollow Creek Farm, proud sponsor of the Children’s, Junior and Young Rider Nations’ Cup events at the Winter Equestrian Festival.